I had a friend years ago who grew up on a farm in Iowa. Every once in a while when the weather was unbearably hot, her mother would call a strike on housework. "You guys wanna eat," mom would say, "go pick your dinner." However, in my friend's case, it meant pig corn, because her father was in the pork business, not the tender kernels of summer juiciness business. The corn was hog feed. Still, it was fresh from the field, and my friend's mom was usually feeling motherly enough, even on strike days, to put on a pot of water to boil. A little butter, a little salt, and a kid could make do with a happy meal she picked herself. I was always a little jealous of my friend's foraged feast. Here in the suburbs of California, the only dinner I'm going to be able to pick is something I've planted myself (and this season is shaping up to be a bummer backyard-food-wise; film at eleven), or an edible something nature has kindly laid in my path. A few weeks ago Cranky and I bought a small handful of fresh purslane at the farmers market. We both know it's a weed, and we both know the farmers know that. However, it's a fashionable weed, and a rather tasty, succulent weed as well. Great for salads, dripping with Omega-3 fatty acids, and cute to boot. We were sort of embarrassed to be paying actual money for the purslane, so we selected only 60 cents' worth (and left half of it to rot in the crisper drawer). 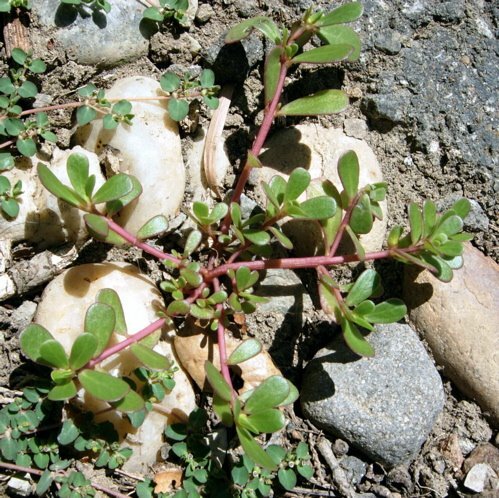 As we walked up the driveway with our purchased purslane, I suddenly spotted that familiar red-stemmed, spider-shaped weed growing out of the rocks, everywhere. Huh! Never saw that before. Then it dawned on me I hadn't seen it before because it's in season now! So. Now when I want to go pick my dinner, I can go root around for some Portulaca oleracea, aka Little Hogweed. Rhymes with little hog feed, and that's fine with me. 23 years ago, I was walking along East 4th Street on the Lower East Side, having just come from the Union Square Farmer's market where they were selling purslane for $4 a pound. There in a window box sprouted a sprig of purslane - wild, not intentional. $4 a pound for anything was a lot of money in those days, and I wondered to myself for a moment whether it was worth it to raid the weed. Because I'd have had to step onto the property, a brownstone with an "area" (paved yard) I decided not to. Here in Oakland I have seen an elderly Chinese lady in my neighborhood digging up purslane from the sidewalks. I'm sorry, I just wouldn't eat street purslane - dogs, lead emissions, etc. In Lebanon they put it into a salad with toasted pita bread that's similar to panzanella. In fact, make a panzanella and use purslane. Lovely. I've geard of purslane, but did't know it was a succulent. When I took my kids out of Manhattan for the summers I had to teach them how to look down, when they were walking in the woods or almost anywhere there might be things worth seeing. We should all remember that. Purslane is one of those everywhere plants; we're lucky to have such stuff available. BTW I have seen Asian women gathering gingko nuts in the fall on SF streets and in the parks. Something to anticipate. Meanwhile, time for fennel pollen and Marin's wild blackberries and plums. Leila: Wow, $4 a pound is a lot even now. What a great tale, from the hardened concrete jungle of Manhattan! I think the weeds growing at our tiny townhouse complex are sufficiently toxin-free (but I'll wash carefully, thanks). Kevin: And you know what else? They say it's tart if it's picked in the morning, but sweeter if you get it when the sun shines on it. Kudzu: If I were taller, I'd nab me some of those gingko nuts too! Oh, you must mean they're picking up fallen nuts. Hmm! I can do that. Anyhow, ours eventually got all leggy and leafless and had to be pulled out. Do you suppose the hot, dry spring we had did it in? No matter. I'll plant more in the fall and see if it likes that part of our growing season. Jamie: I gather that "on-purpose" purslane grows upward, and this local weed grows outward... Other than that, I guess they're similar. Except that the kind I've got here is impossible to eradicate. :) Good luck. Cookie -- Actually the Japanese ladies had long sticks and were knocking them off the branches. Then they put them in (canvas) sacks. They weren't much taller than I am and I am very well under six feet tall. Any tips for cooking purslane? Purslane sprouts in my mom's garden like crazy. However, we've got our own Bean Sprout who likes to "water" the purslane himself, and I am afraid to eat it, just as Leila was commenting about her fear of street purslane. I just orderd a salad a few weeks back and there was a chunk of this in it, I plucked it out with a "WHAT THE H-E-double hockey sticks is this!" I was seen picking bags of this "weed" in the horse pasture of a neighbor one day. Bud asked, between his chewing tobacco, "Watya gonna do wit dat stuff?" Me: "Gonna throw it in a salad." Bud, shaking his head, "Dern city-folk." I had so much of it, I brought some home to my Mom in San Diego. I said, "Llook salad greens." She said,"Huh, we used to feed those to the pigs!" When the garden sets in you are most welcome to come pick your dinner at our place. I know you like tomatoes! So, Jen's Mom: Cooked, I presume. I'm going to scout out some cooked purslane recipes, and cream sauce sounds as good as any. Anni: Well, tell your mom this. The other day Cranky made us each a pretty salad plate for lunch. The purslane in the fridge had gone pretty limp, but he salvaged one leaf to put on my plate. I didn't know what it was, picked it off, and threw it in the bushes! I'll ask Jen's Grandma tomorrow and report. She may remember how her mother used the "pig weed." This is growing in my yard, too--I kept thinking it might be purslane, but I hadn't seen a picture as good as yours, so I wasn't sure. I'm going to have to do some purslane research. I believe it's high in something or other that's good for you--antioxidants, or maybe good fat, can't remember. We aired out jen's grandma& grandpa today. I asked gma about the cooking method. She said that her mother cooked the vegetable in water...probably boiled she said because her mother didn't know about steaming. At some point chopped onion was cooked. A white sauce was assembled using oil instead of butter. Salted & peppered. The white sauce was added to the drained vegetables and some grated jack cheese was added at the end. Jen's gmpa interjected often during the conversation with variations of "Oh, yeah. I liked that a lot" and " I haven't had that in a long time" and why don't you make some?" These people are 86 & 87. They'll be married 60 years in November. They'll probably search all over for purslane tomorrow to re-live the memory of jen's great grandfather's garden. I love you cookie, but I don't always follow the comments threads after a day or so. Which is why I'm glad that mom told me about the convo going on here. I had heard about that recipe from Grandma too, though mom just got more detail than I have ever gotten from them about it. Do you have the Wild Vegetarian Cookbook? It's another foraging book -- there are a couple recipes in it for purslane.